This project focuses geographically on the Bermuda Atlantic Time-series Study (BATS) site. 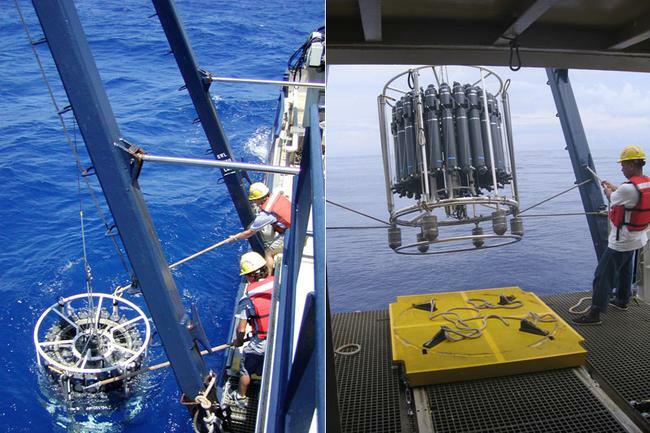 This site is one of the longest time-series studies of oceanographic conditions on the planet and for the past decade has been a test bed for the development of advanced molecular techniques developed to measure microbial diversity. The rich data set from BATS provides important physical, chemical and biological information that is used by the microbial observatory to understand how ocean conditions affect the planktonic microbial communities. The Oceanic Microbial Observatory applies a new high throughput cultivation technology, developed at Oregon State University, to identify, count, and cultivate major oceanic microbial groups that have not previously been cultured. Technologies are also employed to characterize the quality and quantity of organic substrate utilization by these microorganisms. Understanding the cell biology and biogeochemical activities of the major bacterioplankton groups present - SAR11, SAR86, SAR202 and SAR116, marine actinobacteria, SAR324, and SAR406. Read about the dominance of SAR11 in marine environments; Morris, R. M., Rappe, M. S., Connon, S. A., Vergin, K. L., Siebold, W. A., Carlson, C. A., and Giovannoni, S. J. 2002. SAR11 clade dominates ocean surface bacterioplankton communities. Nature 420:806-810. This is achieved by applying new high throughput technologies for cell culturing, and studying the metabolism of these organisms in nature and their interactions with organic matter in the oceans. Read about the development of high throughput culturing technologies; Connon, S. A. and Giovannoni, S. J. 2002.High-throughput methods for culturing microorganisms in very-low-nutrient media yield diverse new marine isolates. Appl. Environ. Microbiol. 68:3878-3885. The research effort is focused on the BATS site, a subtropical gyre characterized by wintertime convective overturn, spring phytoplankton blooms, and regular patterns of DOC cycling. For an overview of BATS see; Steinberg, D.K, C.A. Carlson, N.R. Bates, R.J. Johnson, A.F. Michaels, and A.H. Knap. Overview of the U.S. JGOFS Bermuda Atlantic Time-series Study (BATS): A decade-scale look at ocean biology and biogeochemistry. Deep-Sea Research II 48: 1405-1447. 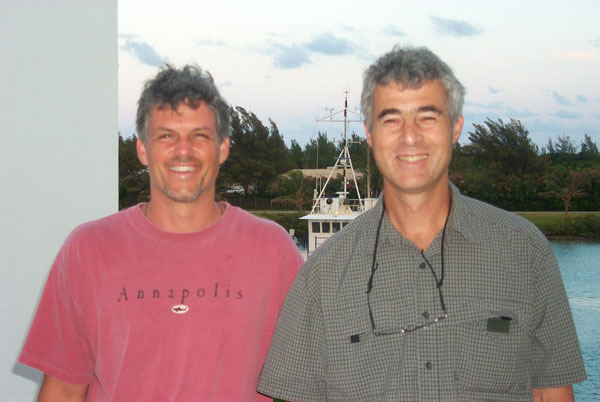 Craig Carlson (left) of the University of California Santa Barbara (UCSB), and Stephen Giovannoni (right) of Oregon State University (OSU). Copyright on all images and material by Craig Carlson and Stephen Giovannoni 2005.